Endorsed for the Cambridge International AS and A Level English Language syllabus (9093), this Teacher’s Resource CD-ROM is packed with practical guidance and support for the planning and delivery of this syllabus. 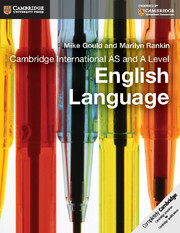 Written in a clear style by an experienced examiner and teacher, Marilyn Rankin, this resource is the perfect complement to the Cambridge International AS and A Level English Language Coursebook. Including lesson plans, worksheets, presentations, indicative answers to Coursebook activities and homework ideas, this comprehensive and invaluable Teacher’s Resource is designed to support all aspects of teaching, saving time on planning and preparation. Includes clear and practical classroom support with 36 lesson plans, accompanying worksheets and presentations including lesson starters and teacher tips saving time in preparation and planning. 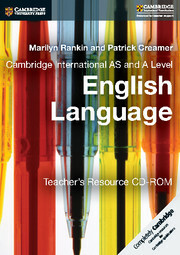 Written by the co-author of the Cambridge International AS and A Level English Language Coursebook, highly experienced examiner, syllabus designer and teacher, Marilyn Rankin. Provides indicative answers to Coursebook activities and guidance on responses to worksheet tasks, supporting teachers with assessment and marking. Navigates a clear path through the Coursebook content helping teachers plan and prepare the classes. Includes a detailed introduction offering guidance and information on how to teach the course and how to make the most of this Teacher’s Resource CD-ROM. Suggested further reading and homework tasks provide a rich bank of content to draw upon saving time in research and planning. Features a planning chart setting out various options for delivery plans for Cambridge International AS and A Level English Language, including options for co-teaching. 36. Theories of language acquisition.